A self-supporting shrubby clematis for pots and borders. Superb new Clematis that is perfect for small gardens and growing in patio containers. Compact in habit, reaching just 30in tall in a season, easy to manage. Fragrant blue flowers throughout the summer. Flowers on new wood so pruning is simple - just cut back to a few inches above ground in early spring. Delivered as established plants in 9cm pots. A superb new Clematis that is perfect for small gardens and growing in patio containers. Compact in habit, reaching just 30in tall in a season New Love bears lustrous green foliage it's easy to manage needing no support. 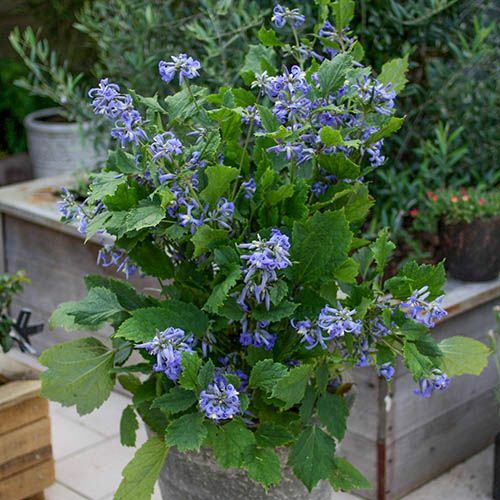 Blooms profusely throughout the summer giving a succession of sweetly fragrant blue flowers that are a true butterfly magnet. Easy to grow, 'New Love' flowers on new wood so pruning is simple - just cut back to a few inches above ground in early spring. Supplied as an established plant in a 2L pot, ready for immediate planting out or potting up into your favourite container! For best results, grow in full sun. Plant with the crown of the clematis at soil level and in spring, apply a mulch of well rotted manure or compost to the base of the plant, taking care not to cover it. Can also be grown in pots and containers, using a soil based compost such as John Innes No.3. Feed and water frequently throughout the growing season. Herbaceous clematis will die back to the ground in winter, but you can leave the stems in place until spring.